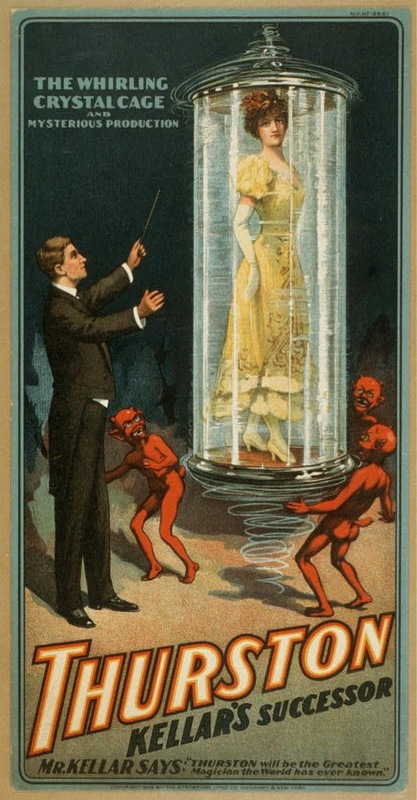 "Before the final curtain had fallen Kellar led me to the foot- lights and in a most touching speech briefly mentioned his own career of forty-five years as a public entertainer, and finished with a generous and affectionate prediction of my future. Kellar had played Ford's Opera House for many years. He handed his arm around my shoulders, while the orchestra played 'Auld Lang Syne'. As the ushers carried many floral offerings to the stage, the audience sang with the music. Finally, the musicians stood, then the entire audience was on its feet repeating the refrain. Leaning heavily on my shoulder as the curtain dropped for the last time, Kellar cried—so did I." What was the Mantle of Magic? Essentially, it was nothing more than a business transaction between Kellar and Thurston. But that is too boring, so they put a theatrical spin to the whole affair and created this idea of passing Kellar's Mantle onto Thurston. For the 1907-08 Season, Kellar and Thurston toured the U.S. together. 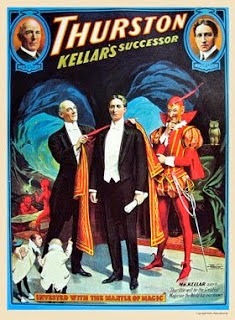 All of the posters for the tour featured an image of Kellar's face in the upper corner and Thurston's face in the opposite corner. The final poster above, was the only one with a full sized image of both Thurston and Kellar, that I'm aware of. I'm not sure how long Thurston continued using the Kellar endorsement after that iconic event. But it's clear he did continue to use "Kellar's Successor" for some time. Today, all parties associated with the event are long gone. Thurston and Kellar have low since passed away. Even the Ford's Theatre in Baltimore is gone. But we have the posters, playbills and history to look back upon and fondly remember an important event in the annals of magic. Wow, I've never seen that Thurston poster before. I believe this same mantel had been passed a few more times and ultimately to Lance Burton. Did Lance pass it on to anyone? Well, Legend has it that Thurston passed it to Dante and Dante passed it to Lee Grabel and Lee Grabel passed it to Lance. But, I never quite understood the Lee Grabel thing because Dante never passed it before he died. As for Lance, he still has the Mantle, hasn't passed it on. As you might know, Kellar had misgivings about passing the mantle and selling his show to Thurston. It had much to do about Thurston mangling the Levitation illusion. Inviting people on stage to witness it up close. Too close. I don't think Lance has found a worthy successor yet.